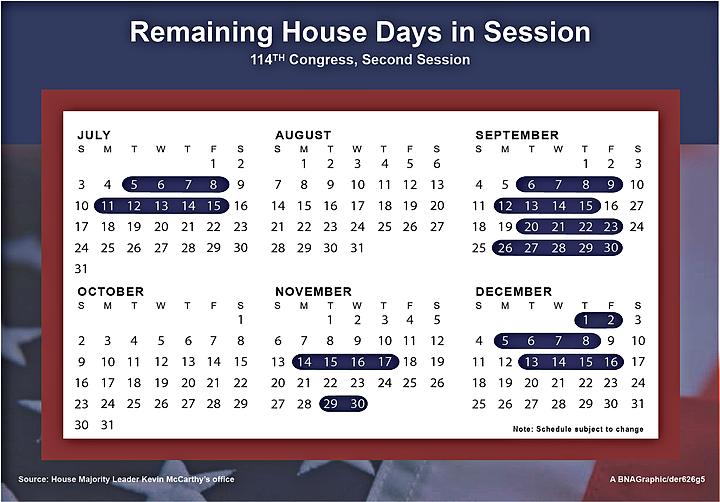 July 8 — Plans by House and Senate Republican leaders to pursue “regular order” and get the appropriations process back on track are meeting a bitter end, with the two chambers preparing to leave for a seven-week recess without completing any of 12 spending bills. As the House begins the work week of July 11, its last before the break, Majority Leader Kevin McCarthy (R-Calif.) said lawmakers will consider the Interior-Environment spending bill. Passage of that bill would only bring to five the number of measures that won initial House passage this summer. Two of the most contentious bills still have not emerged from committee. The situation is similar in the Senate, where Majority Leader Mitch McConnell's (R-Ky.) plan to use 12 weeks to consider all 12 bills ran aground amid battles over amendments. McConnell managed to get three of the measures passed—including two he combined into one “minibus”—but the outlook for any more to clear their first hurdle as the break nears is poor. Democrats said they won't support a last-minute effort to bring the $575 billion Defense appropriations bill to the floor because they fear that once the Pentagon bill is finished, Republicans will leave the domestic measures to languish. Looming in September is a new continuing resolution to (CR) prevent any funding lapse when the government's new fiscal year begins Oct. 1. 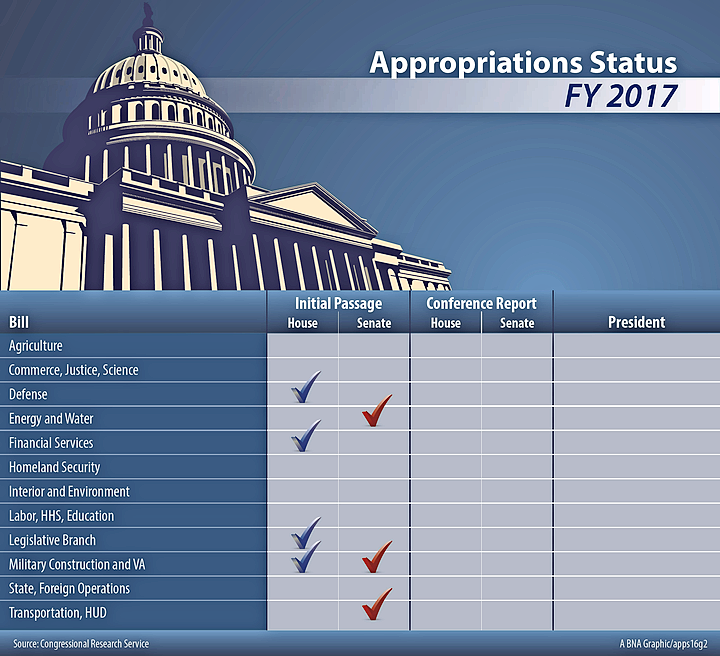 Appropriators said they want that CR to run into December to provide time to craft a post-election, 12-bill omnibus package. House Appropriations Committee Chairman Harold Rogers (R-Ky.) said he opposes conservatives' calls to simply pass a stopgap bill running until after a new president is sworn into office. “[I]f we did a CR through March, that's waving the white flag saying we can't do our work and things would just grind quickly to a halt,” Rogers told reporters. Republican leaders' plans to move out early were stymied when the same conservatives balked at following the $1.07 trillion discretionary spending cap in last fall's budget deal to craft the measures. The dispute left leaders unable to develop a fiscal 2017 budget resolution and bring spending bills to the floor before May 15 (See previous story, 05/16/16). After that, the House quickly passed the bipartisan Military Construction and Veterans Affairs bill (H.R. 4974) and the Legislative Branch bill (H.R. 5325). But the otherwise popular Energy and Water bill (H.R. 5055) was shelved amid a dispute over an amendment to protect gay employees of federal contractors. House leaders subsequently brought bills up under rules that restricted amendments, including on Defense (H.R. 5293). More recently, McCarthy brought up some of the most controversial of the 12 bills as Republicans sought to position themselves for the party's convention the week of July 18. Late July 7, the House approved the Financial Services bill (H.R. 5485) carrying $1.5 billion in cuts, including for the Internal Revenue Service, on a party-line vote. Next up is the Interior-Environment bill (H.R. 5538) with more cuts and riders—including many designed to upend President Barack Obama's environmental rulemakings—that Democrats also won't support. “With the conventions coming [and] taking so much time out of our schedule, it's made it doubly difficult to get anything done,” Rogers said. Rogers said his focus now is on marking up the last of the 12 bills—State Foreign Operations and Labor Health and Human Services (numbers not available)—in committee before the break. Then, he said, the panel will be ready to discuss them informally with members of the Senate Appropriations Committee. “So we will have 12 bills in each body that we can begin to compare notes on, leading to whatever comes next,” Rogers said. Senate Democrats strongly backed the bills by Senate Appropriations Chairman Thad Cochran (R-Miss.) reflecting the $1.07 trillion cap. They also supported McConnell's plan to pass Milcon-VA and Transportation, Housing, and Urban Development as a package (H.R. 2577) and use that to carry $1.1 billion in funds to combat the Zika virus threat. Also drawing bipartisan support was the Energy and Water bill (H.R. 2028). But McConnell delayed work on Defense, and the Commerce-Justice-Science bill (H.R. 2578) he brought up instead was shelved once it ran aground over gun-related amendments. Democrats then balked when they saw House Republicans insert into the House-Senate Milcon-VA conference report riders targeting Planned Parenthood, promoting the Confederate flag, and more. Minority Leader Harry Reid (D-Nev.) said Democrats now fear a similar scenario would play out if they agreed to pass the Defense bill and it moved to conference. As a result, Democrats opposed McConnell's motion to start work on Defense late July 7. The vote was 50-44, with McConnell getting far fewer than the required 60 votes. Reid said Democrats wanted—and didn't receive—assurances that Defense wouldn't be increased by another $18 billion while non-defense was frozen. Other Democrats said they fear Republican leaders could work to enact stand-alone Milcon-VA and Defense bills that appeal to their core constituencies but then use a CR to fund the rest of the government.